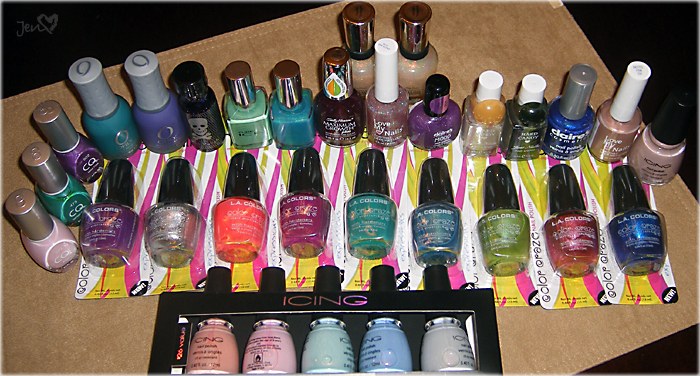 In two days I've amassed quite a haul of nail polish. Four more are on their way so they can't be in the photograph. And I bought another one today that I forgot to put in the photo. Top row: CQ Angel, Tahitian Green, Violet Frost. Orly Plastix Collection - Viridian Vinyl, Purple Pleather. Hot Topic has no name but its the most sparkly dark purple I've ever seen. Pure Ice - Free Spirit, Heartbreaker. Sally Hansen Adoring Amethyst. Love My Nails Dazzle. Claire's Mood polish has no name, its a purple with sparkles that turns pink when warm. Hard Candy - Sugar Daddy, Envy. Claire's Burple. Love My Nails Frosted Pink. Icing Skinny Dip.